A likable loser takes cold calling to a new level in Boots Riley’s gleefully anarchic directorial debut that tackles race and class with the flair of peak Woody Allen. 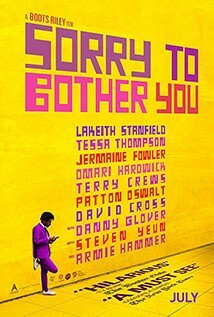 In an alternate present-day version of Oakland, black telemarketer Cassius Green (Lakeith Stanfield) discovers a magical key to professional success – he begins to talk like a white man. As he starts to make sale upon sale, Cassius falls under the spell of his company's cocaine-snorting CEO Steve Lift (Armie Hammer), who offers him a salary beyond his wildest dreams. Pinballing frenetically between amusement, absurdity and anger, this is an unruly piece which takes pointed pot-shots at coercive capitalism before galloping toward an impressively unhinged third act. This is a unique comedy that critics are calling a modern masterpiece, and even the saviour of the struggling comedy genre.